Rheumatoid arthritis occurs when your immune system mistakenly targets your own body. It especially affects the lining of the joints between your bones and causes symptoms such as swelling, pain and stiffness. Psoriatic arthritis occurs in people who have the skin disease psoriasis. Swelling and warmth in the joint. Limited movement – making daily activities such as getting into a car or crouching down difficult. A creaking, crackly sound when the knee moves. Your doctor will talk to you about your symptoms and will do a physical examination of your knee. Before your appointment, take note of what things make your knee better or worse and when you notice the pain. Also, try to find out if anyone else in your family has experienced arthritis. blood tests, which can detect rheumatoid arthritis. There is no cure for knee arthritis, but there are many ways you can relieve your symptoms and help prevent these from getting worse. Of the following strategies for managing knee arthritis, exercise and weight loss (if overweight) are seen as particularly important. Taking part in an exercise programme which includes a mix of stretching, strengthening and cardiovascular exercises can reduce pain, improve movements and delay the need for surgery. Regular exercise keeps your muscles strong and your joints flexible. It is also important for balance. For those who are overweight, weight loss reduces stress on the joints. 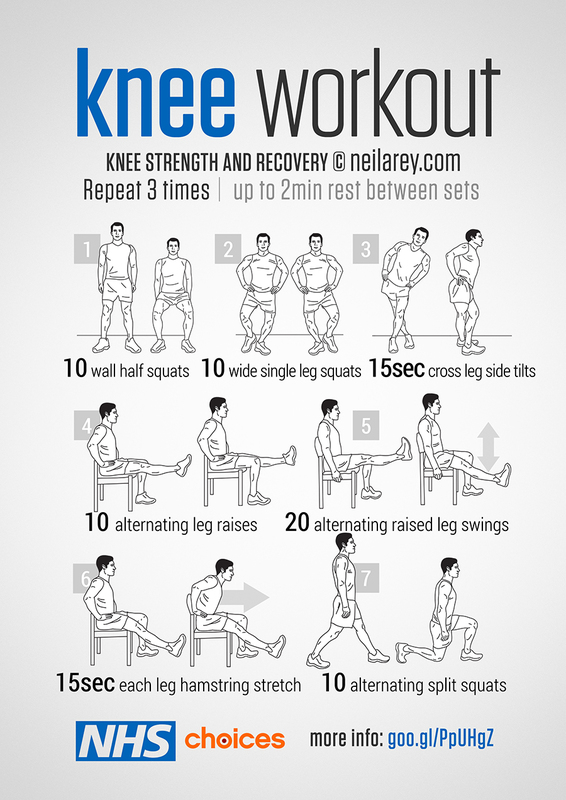 Loosing even a small amount of weight, if needed, can greatly reduce knee pain. Your doctor or other healthcare professional can help you develop a self-management plan. This will provide you with practical advice on how to increase your skills and confidence in managing your symptoms. Read more about self-management support. If you are having trouble with daily activities, physiotherapy or occupational therapy can help. Physiotherapists can show you ways to strengthen your muscles and improve flexibility. Occupational therapists teach you things such as how to pace your activities through the day. Spreading physically hard jobs (such as housework, mowing the lawn) throughout the day, rather than trying to do them all at once. Combined pain relief medications – paracetamol together with a codeine-like drug. These are painkillers that also reduce inflammation. Common examples are ibuprofen and naproxen (Naprosyn). Creams and gels containing capsaicin (Zostrix) which are applied to the skin of the painful area. Read more about pain relief medications. Tape or a brace for your knee: There are lots of devices, including joint braces, splints and tapes. Wear shoes with thick soft soles that act as shock absorbers for your knees. Avoid high heels. Use a walking stick to reduce the weight and stress on a painful knee. A physiotherapist can advise on the correct length of the stick and how to use it properly. Practice relaxation techniques to help your body relax when you are not being active to help relieve pain. Most people do not need surgery for knee arthritis; symptoms can be managed by a combination of the measures listed above. Joint surgery may be recommended for some people if the joint wears out over time. OARSI guidelines for the non-surgical management of knee osteoarthritis Osteoarthritis Research Society International, Osteoarthritis & Cartilage Vol. 22 (2014). Video about the benefits of physical activity in people with arthritis. Recommendation 7. We recommend nonsteroidal anti-inflammatory drugs (NSAIDs; oral or topical) or Tramadol for patients with symptomatic osteoarthritis of the knee. Recommendation 12. We cannot recommend performing arthroscopy with lavage and/or debridement in patients with a primary diagnosis of symptomatic osteoarthritis of the knee. Strength of Recommendation: Strong"
Extract from Treatment of Osteoarthritis of the Knee, Summary of recommendations, 2nd edition See full summary of recommendations. "The new (Osteoarthritis Research Society International) guidelines recommend a set of non-pharmacological core treatments as appropriate for all individuals (listed in order from highest benefit-to-risk score to lowest): land-based exercise, weight management, strength training, water-based exercise, and self-management and education. For weight management, the OARSI guidelines make a specific recommendation of achieving a 5% weight loss within a 20- week period to be effective at treating knee OA."